Sixty-year-old Kimberly Winkler thrust a victory fist in the air and exclaimed, “awesome,” in response to her blood pressure reading of 126/60. The Edwardsville Police Department administrative assistant was one of approximately 400 people who took part in Blood Pressure Blitz 2017. The Southern Illinois University Edwardsville School of Pharmacy (SOP) and the City of Edwardsville hosted the citywide wellness event from Thursday-Friday, Oct. 26-27. Knowing your blood pressure numbers are essential to achieving and maintaining good health, according to SOP Professor and Director of Clinical Programs Chris Lynch, PharmD. Sixteen teams of third and fourth-year pharmacy students, paired with a faculty pharmacist, visited more than 30 local businesses and performed blood pressure screenings for employees at no cost. 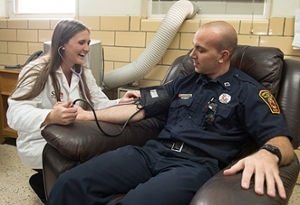 Checking on Edwardsville Firefighter Craig Kemper is Karlee Rumler, fourth-year pharmacy student. 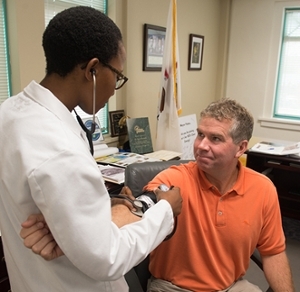 Edwardsville Mayor Hal Patton holds still to have his blood pressure checked by Relebohile Sekonyela-Rakolanyana, third-year pharmacy student.